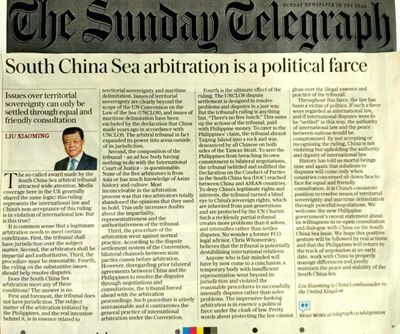 The Sunday Telegraph Publishes A Signed Article by Ambassador Liu Xiaoming Entitled "South China Sea arbitration is a political farce"
The so-called award made by the South China Sea arbitral tribunal attracted wide attention. Media coverage here in the UK generally shared the same logic: this ruling represents the international law and China's non-acceptance of this ruling is in violation of international law. But is this true? It is common sense that a legitimate arbitration needs to meet certain conditions. First, the tribunal shall have jurisdiction over the subject matter. Second, the arbitrators shall be impartial and authoritative. Third, the procedure must be reasonable. Fourth, the ruling on the substantive issues should help resolve disputes. Does the South China Sea arbitration meet any of these conditions?The answer is no. First and foremost, the tribunal does not have jurisdiction. The subject matter of the arbitration initiated by the Philippines, and the real intention behind it, is in essence related to territorial sovereignty and maritime delimitation. Issues of territorial sovereignty are clearly beyond the scope of the UN Convention on the Law of the Sea (UNCLOS), and issues of maritime delimitation have been excluded by the declaration that China made years ago in accordance with UNCLOS. The arbitral tribunal in fact expanded its power into areas outside of its jurisdiction. Second, the composition of the tribunal – an ad hoc body having nothing to do with the International Court of Justice – is questionable. None of the five arbitrators is from Asia or has much knowledge of Asian history and culture. Most inconceivable in the arbitration process was that two arbitrators totally abandoned the opinions that they used to hold. This only increases doubts about the impartiality, representativeness and the authoritativeness of the tribunal. Third, the procedure of the arbitration went against normal practice. According to the dispute settlement system of the Convention, bilateral channels between state parties comes before arbitration. However, disregarding prior bilateral agreements between China and the Philippines to resolve the disputes through negotiations and consultations, the tribunal forced ahead with the arbitration proceedings. Such procedure is utterly unreasonable and it contravenes the general practice of international arbitration under the Convention. Fourth is the ultimate effect of the ruling. The UNCLOS dispute settlement is designed to resolve problems and disputes in a just way. But the tribunal's ruling is anything but. "There's no free lunch". This sums up the actions of the tribunal, paid with Philippine money. To cater to the Philippines' claim, the tribunal shrank the Taiping Island into a rock and was denounced by all Chinese on both sides of the Taiwan Strait. To save the Philippines from breaching its own commitment to bilateral negotiations, the tribunal belittled and nullified the Declaration on the Conduct of Parties in the South China Sea (DOC) reached between China and ASEAN countries. To deny China's legitimate rights and interests, the tribunal turned a blind eye to China's sovereign rights, which are inherited from past generations and are protected by the UN Charter. Such a recklessly partial tribunal creates more problems than it solves, and intensifies rather than solves disputes. No wonder a former FCO legal advisor, Chris Whomersley, believes that the tribunal is potentially destabilising the overall stability of international relations. Anyone who is fair-minded will have by now come to a conclusion: a temporary body with insufficient representation went beyond its jurisdiction and violated the reasonable procedures to successfully intensify disputes rather than solve problems. The impressive-looking arbitration is in essence a political farce under the cloak of law. Pretty words about protecting the law cannot gloss over the illegal essence and practice of the tribunal. Throughout this farce, the law has been a victim of politics. If such a farce were regarded as international law, and if international disputes were to be "settled" in this way, the authority of international law and the peace between nations would be compromised. By not accepting or recognising the ruling, China is not violating but upholding the authority and dignity of international law. History has told us mortal beings time and again that solutions to disputes will come only when countries concerned sit down face to face for equal and friendly consultation. It is China's consistent position to resolve issues of territorial sovereignty and maritime delimitation through peaceful negotiations. We welcome the new Philippine government's recent statement about its willingness to re-open consultation and dialogue with China on the South China Sea issue. We hope this positive gesture will be followed by real actions and that the Philippines will return to the track of negotiation at an early date, work with China to properly manage differences and jointly maintain the peace and stability of the South China Sea.